A New Collection has been released from the studio and we have begun uploading the new beauties. We will continue adding more from this collection over the weeks ahead,so be sure to check back and claim your favorites. 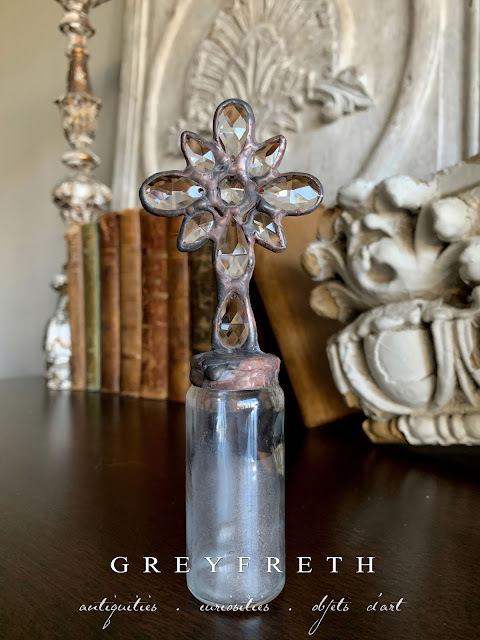 A rhapsody of rustic and refined - Framed out in heavy, organically sculpted, weathered solder, a fiery floral finial of the highest quality leaded Austrian crystal catches and refracts an amazing amount of light - throwing a confetti of color in all directions. At the heart sits a brass relief of a Renaissance Putti and iconic clam shell motif veiled in a faint and lovely verdigris. Full of beautiful complementing and contradicting elements -- the rusty solder and patinas are a beautiful contrast to the opulent crystal. A rosary chain of oil rubbed bronze and rock crystal suspend beautifull brass religious medals which adds a sacred element while tying in with the putti heart. The palest of lavender is beginning to emerge from the antique glass — a phenomenon created by the interaction between a no longer used ingredient within the glass and the UV rays of the sun. These bottles are known as Sun Purple Bottles. The crystals and Putti center are faceted on both sides so you can decide which should face forward. A beautiful and unique addition for the discerning collector. A rhapsody of gorgeous texture and tones - Framed out in heavy, organically sculpted, crusty solder, a fiery Laurel Wreath created from different styles and sizes of chandelier crystal catches and refracts an amazing amount of light - throwing a confetti of color in all directions. Small teardrops of Czechoslovakian crystal bejewel the finial giving it an ornate presence. Suspended from a rosary of bronze and rock crystal, a simple yet elegant 2-sided St. Benedict medal, bringing in an beautiful element of grace. Serving as a unique crown, a plethora of fiery Austrian crystal teardrops chase one other in a never-ending soldered circle of simple, yet elegant beauty. The highly refractive leaded crystal is a stunning juxtaposition to its pedestal of unearthed glass. Time and the elements have worked their magic over the decades and have left behind a subtle, ethereal white patina. The facets are cut to catch and refract an enormous amount of light, setting off an explosion of color when the light happens upon the surface of the crown. A Rhapsody of Rough and Luxe --An exquisite display of chandelier crystals in varying ages, shapes and sizes form an ornate and impressive cross. The contrasting yet complementing elements are endless here -- The profusion of crystal twinkles from within the frame of rough, dark solder that forever binds each to the other and to the bottle serving as a pedestal. A beautiful lariat featuring a vintage sterling cross and antique rosary beads worn smooth over the years bejewels the neck while remnants of the earth that once hid the bottle from sight for decades is now forever held within the walls of glass behind a veil of ethereal patina. 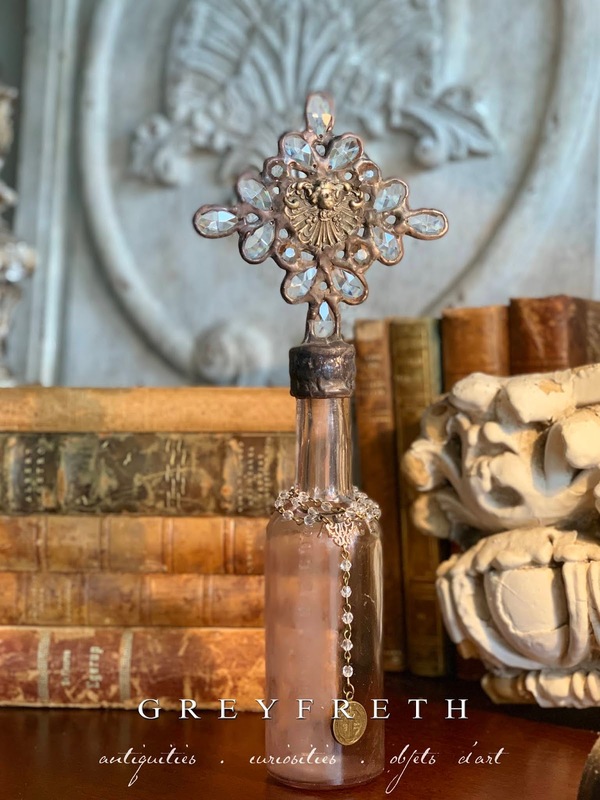 Held fast by organically sculpted, rustic solder in weathered and timeworn hues, a plethora of fiery multi-faceted, both weighty and diminutive crystal chandelier remnants form this striking cross. The crystals are faceted on both sides, allowing you to determine which side to face forward. The crystal cross offers an element of refinement which beautifully complements and contrasts with the rustic nature of the metalwork and the ethereal patina of the unearthed antique bottle. This powerhouse of beauty has all the magic of our larger pieces. Framed out in heavy, organically sculpted, weathered solder, a fiery cross of antique leaded crystal chandelier remnants catches and refracts a confetti of color in all directions when the light dances across its faceted surface. The weathered, crusty solder is a beautiful contradiction in texture and presence to the step-cut French crystal. 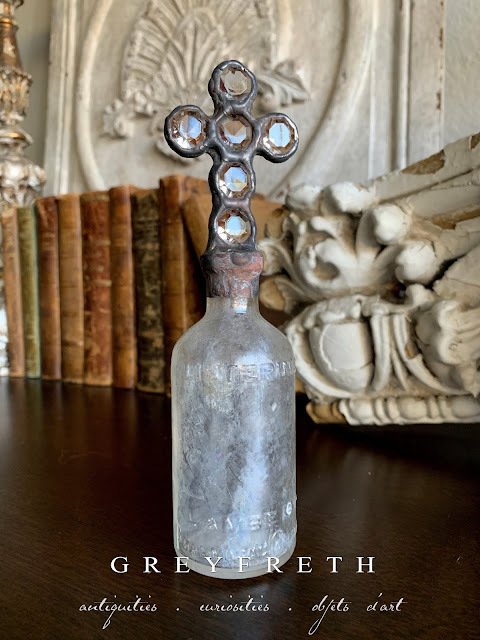 The antique glass bears an embossed logo for Lambert Pharmacal Company and the entire bottle is veiled in an ethereal patina of pale white. Commanding in beauty and elegant in its simplicity, this piece is a perfect addition or start to your collection. The meticulously cut antique chandelier crystals of this simple yet elegant cross twinkle in stark and beautiful contrast to the rough frame of aged solder that binds them. The square crystal has been turned on its axis to provide more refraction and interest. 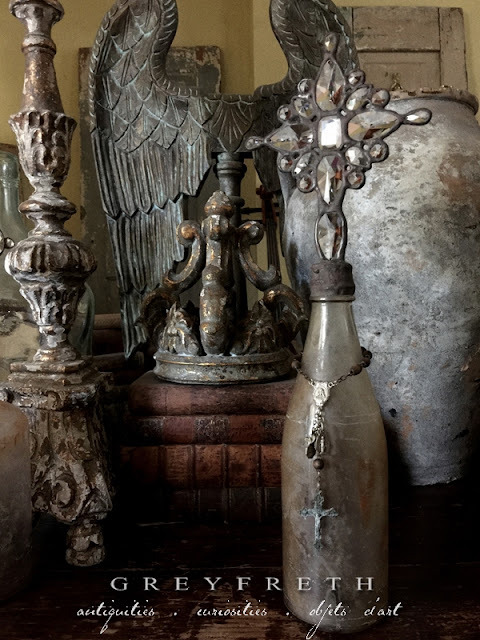 An unearthed vessel of antique glass has been banded in a ring of rust hued metalwork and serves as a perfect pedestal in this lovely juxtaposition of rough and elegant. Petite and Sweet! Meticulously cut diminutive chandelier crystals of this simple yet elegant cross twinkle in stark and beautiful contrast to the rough frame of aged solder that binds them. A petite vintage vessel of beautifully cut crystal serves as a perfect pedestal in this lovely juxtaposition of rustic elegance. Small in stature, but powerful in beauty. Pieces from our Diminutive Collection are beautiful alone, grouped or peppered into any of our collections. We love a cluster of these little powerhouses of beauty on a coffee table, in a mantle vignette, as part of a bookshelf display, on a bedside table - the possibilities are endless. Held fast by rustic solder in weathered and timeworn hues, fiery multi-faceted icicles of Austrian crystal form a large starburst southern cross. Crowning a rare and coveted, circa 1890 - 1910 apothecary relic of antique, wavy mercury glass that has developed a beautiful and natural patina over time. We were lucky enough to stumble upon a good many of these years ago and release a few of them at the Holidays. 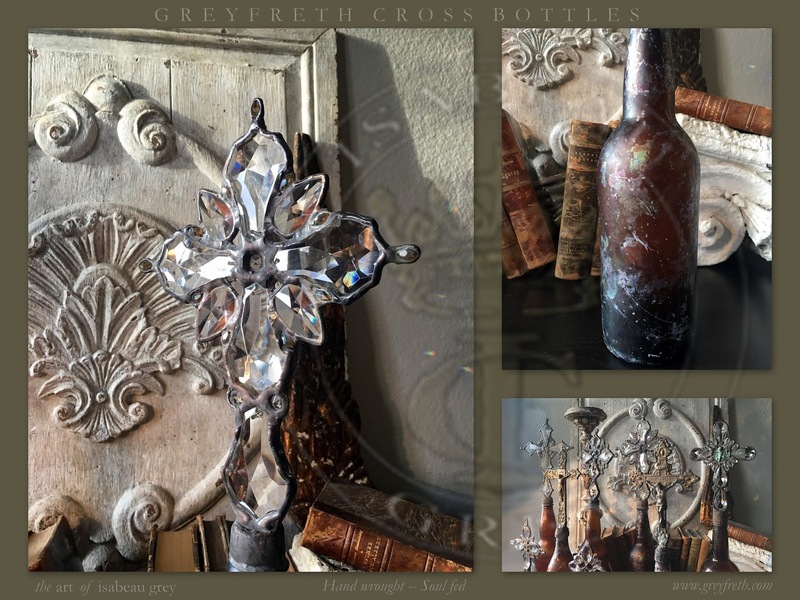 The leaded crystal of the cross catches and refracts light beautifully - throwing light in a confetti of colors. 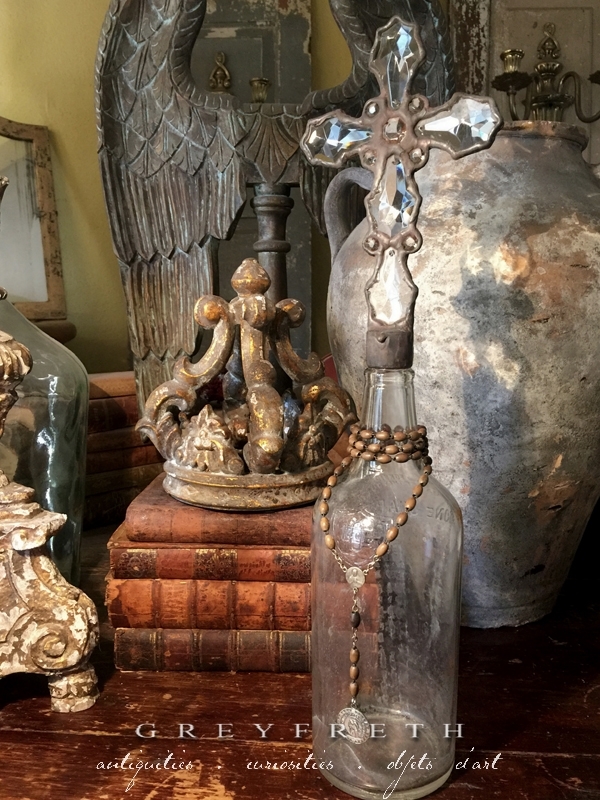 Juxtaposing the ornate cross is the fading silver of the antique bottle. 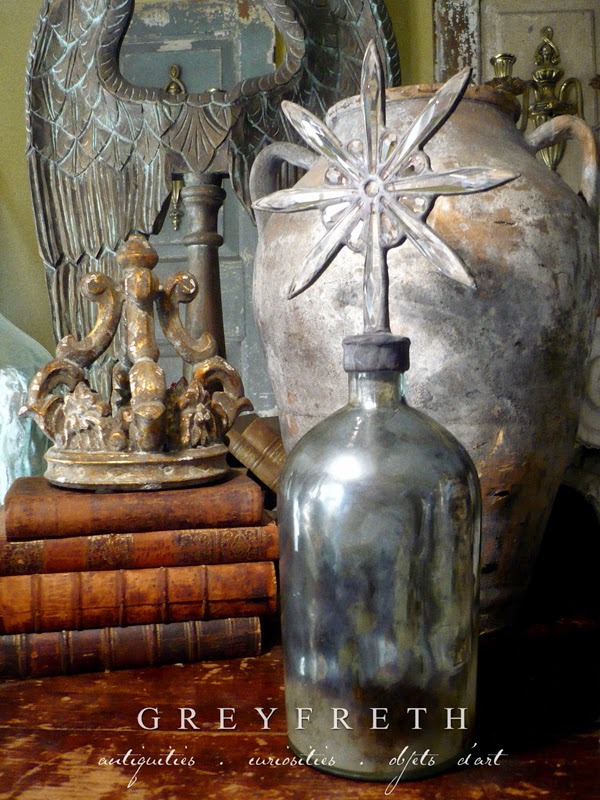 Gleaning silver in certain light, showing gold undertones in other and a steely almost blue in different lighting, the bottle has many moods. This is due to the silver that was once locked away tight between two walls of glass to protect the contents from being affected by light. Long after the contents were used and the bottle discarded, the silver was kept pristine until time and the elements managed to wear down the barrier between the walls. No matter how slight, no matter how small, water, carrying with it minerals and remnants of the area seeped into the silver and over decades, forever changed the landscape and hues of the silvered surface. Every bottle is different - depending on where it spent its century cast away. Each, an individual work of art influenced by the hand of the natural world. This cross bottle is the 4th made in 4 years. It is signed. It is part of a limited Southern Cross Starburst and Mercury Glass series. Our first Starburst bottle is seen in the group photo. That photo went viral on the internet and is the most recognized image of my work. A rhapsody of rustic and refined - Framed out in heavy, organically sculpted, weathered solder, a fiery cross in a plethora of sizes, ages and styles, of the highest quality leaded Austrian crystal catches and refracts an amazing amount of light - throwing a confetti of color in all directions. Full of beautiful complementing and contradicting elements -- the rusty solder, patina and crusty antique rosary are a beautiful contrast to the opulent crystal. Draped around the neck of the unearthed bottle is a lariat made from antique rosary remnants and hand carved beads that are worn from being prayed over for years. A small solid silver medal suspends from the yoke and a large, heavy, antique silver St. Anne medal serves as a beautiful anchor, all bringing a beautiful and sacred element to this piece. Perfectly paired with any of our collections. A plethora of large, ornate and mesmerizing chandelier crystals bloom from an enormous, beautifully cut crystal center. 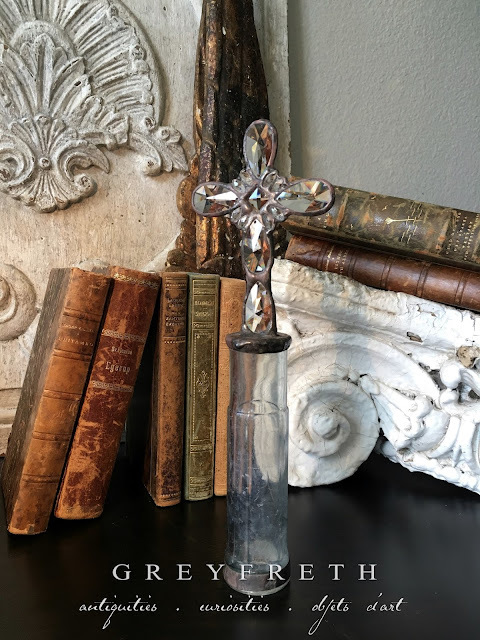 Organically sculpted solder frames the crystals and binds the cross to an unearthed bottle of antique glass- the weathered iron hues in the patina complement the weighty and worn gold and mother of pearl rosary which is a piece of art in and of itself. Swaths and sprays of the earth which hid the bottle away for over a century create a delicate pattern and don the inner walls of the bottle, memories of other times long past. A stunning beauty that can stand alone or bring magic to any of our collections. 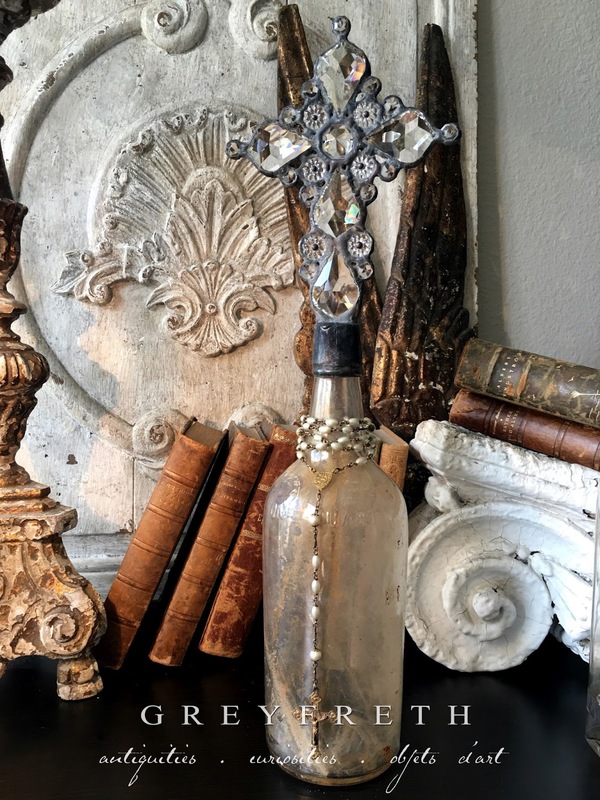 An ornate cross of meticulously cut Austrian and Czech chandelier crystals crowns an unearthed bottle of weighty antique glass; the ethereal patina boasts subtle flashes of iridescence when the light washes over it. Forever held within the confines of heavy solder, imbued in the weathered hues of rusted and salt eaten iron, the lovely crystals throw light in all directions with their multi-faceted surfaces. The crystals are faceted on both sides, allowing you to determine which side to face forward. 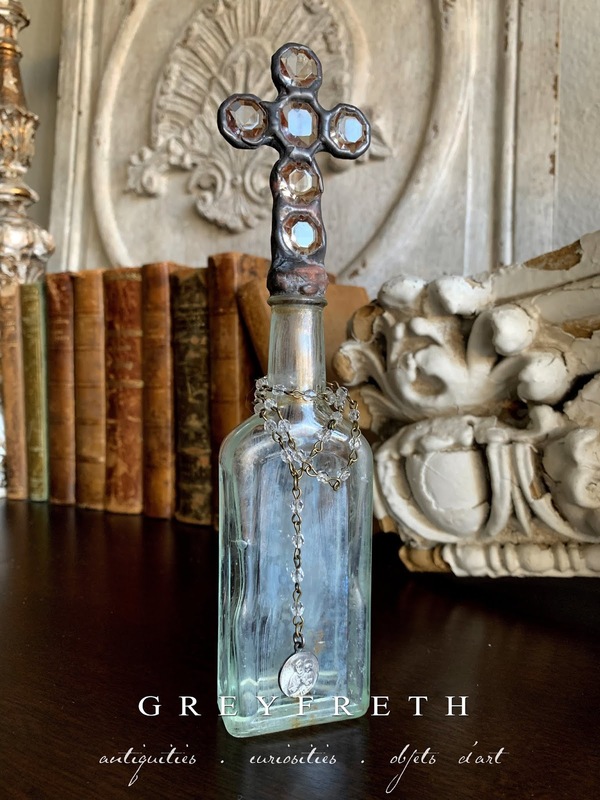 Draped around the neck of the bottle is an antique Italian rosary created with beautiful hand-carved rosary beads that are close to a century old. Suspended from the rosary is a beauty connector with Our Lady of Grace and a simple but powerful crucifix, both hallmarked sterling silver and bringing a beautiful scared element to the piece. This entire work of art is a beautiful study in contradiction: old and new, rough and luxe, rustic and refined. Gorgeous alone and stunning mixed in to any of our collections. Framed within heavy, weathered solder, a stunning and substantial cross of leaded Austrian crystal chandelier remnants provides a beautiful example of the juxtaposition of rough and refined. Supporting the large cross is a bottle that was excavated during shipwreck dive in the depths of the Atlantic Ocean. 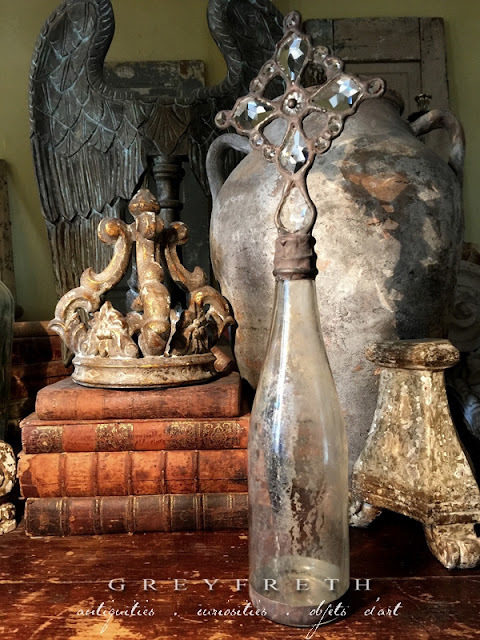 It is a circa 1880 antique cork top amber bottle donned in a spectacular masterpiece of a crusty, iridescent and rusty patina. Naturally created below the sea for over a century, the patina is imbued with an absolute riot of amazing colors that change as the light dances across the surface of the weighty, antique glass. I have matched and aged the patina on the sculpted solder so it looks like the cross and bottle were always a single piece. An antique rosary of diminutive amethyst beads bejewels with a cross bearing a patina painted by time wraps the neck of the bottle, adding an element of grace. An extremely special cross bottle for the discerning collector. A piece that can stand alone or bejewel your existing collection. Photographs do not do this piece justice. The crystals refract and throw an amazing amount of light with a confetti of color and are much more clear and brilliant than the pictures show. See additional photos below. A Rhapsody of Rough and Luxe. Framed out in heavy, organically sculpted solder, an exquisite display of chandelier crystals form an ornate, incredibly refractive and impressive cross. The contrasting yet complementing elements are stunning here -- The profusion of refined crystal explodes with a confetti of refractive colors from within the frame of rough, dark solder that forever binds each to the other and to the weighty, unearthed bottle serving as a pedestal. 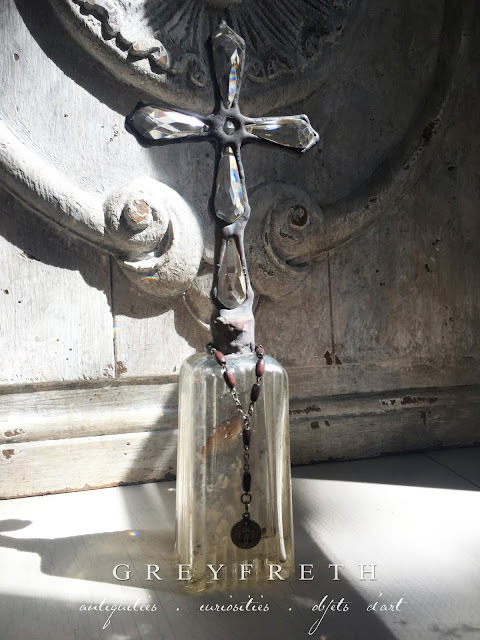 A band of metalwork rings the bottle while An antique rosary graces the neck of the bottle adding a beautiful and sacred element. Large, elegant and beautifully austere antique chandelier crystals radiate from a beautifully aged antique silver religious medal that sits at the heart of the cross, forming a simple yet powerful work of art.The contrasting yet complementing elements are endless here -- The highly refractive crystal twinkles from within the frame of rough, rusted iron-hued solder that forever binds each to the other and to the bottle serving as a pedestal.A band of weathered metalwork rings the base of the bottle while a subtle, ethereal patina of soft white veils the interior. 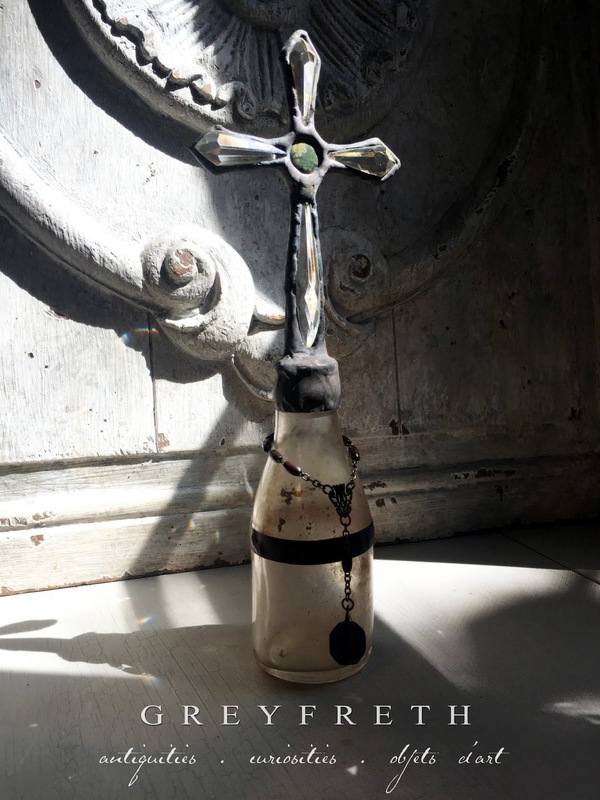 Bejeweling the bottle's neck is an antique rosary of ebony, worn smooth from decades of prayer. Suspended from the beads are antique silver religious medals which ties into the cross'center and adds another beautiful element of Grace. This pieces has a substantial and magical presence. Framed out in heavy, organically sculpted, weathered solder, a fiery cross of Harlequin cut crystal catches and refracts an amazing amount of light - throwing a confetti of color in all directions. Small radiant cut octagons of Austrian crystal ring the center of the cross like a halo, while multi-faceted teardrops of Czech crystal add a bit of whimsy. Suspended from a simple drape of brass strung crystal beads is beautiful antique religious medal of sterling, bringing in an element of grace. 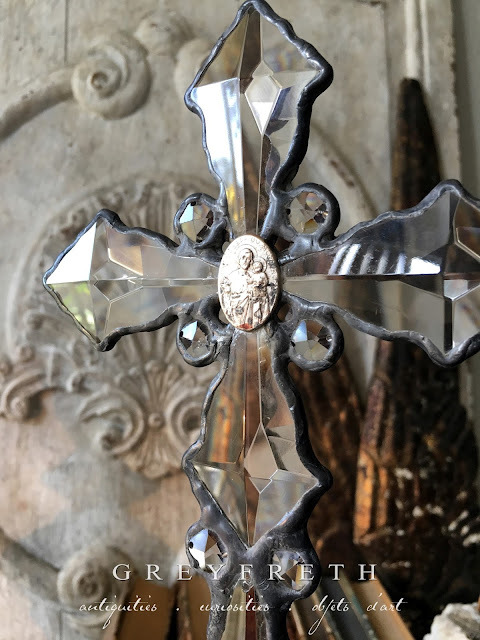 Framed out in heavy, organically sculpted solder, a plethora of Austrian crystal in varying sizes, shapes and age form an ornate and elegant starburst cross. Meticulously cut, the refined crystal refracts an incredible amount of light which explodes into a stunning confetti of color. 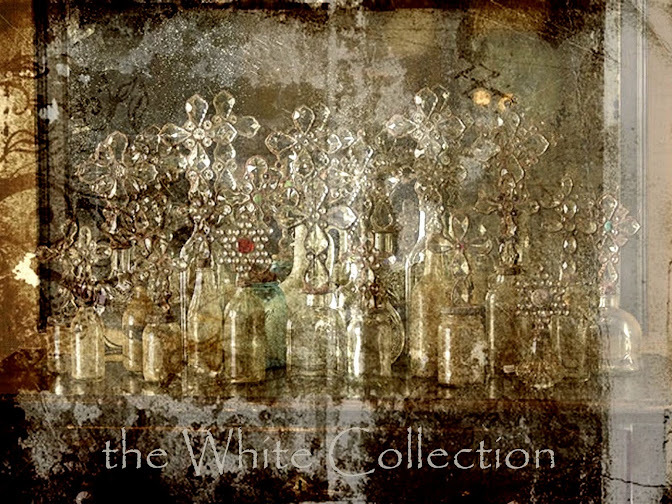 Serving as the pedestal is rosary laden unearthed bottle of antique glass donned in a ethereal patina of soft white. A beautiful piece of our starburst series. A perfect addition to any of our collections and striking enough to stand on its own. A Rhapsody of Rough and Luxe. 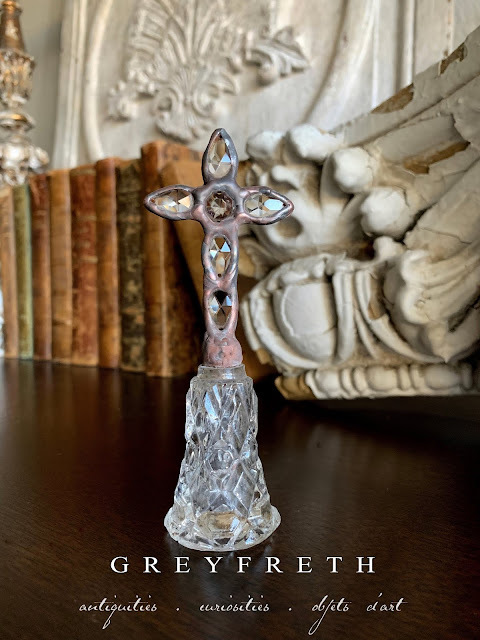 Framed out in heavy, organically sculpted solder, an exquisite display of chandelier crystals in varying ages, shapes and sizes form an ornate, incredibly refractive and impressive cross. The contrasting yet complementing elements are stunning here -- The profusion of refined crystal explodes with a confetti of refractive colors from within the frame of rough, dark solder that forever binds each to the other and to the unearthed bottle serving as a pedestal. 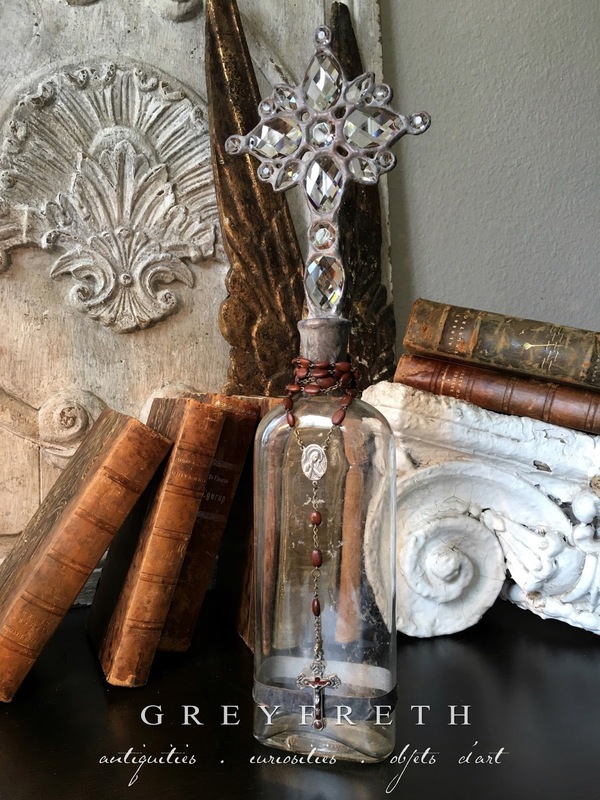 An antique rosary graces the neck of the bottle adding a beautiful and sacred element. 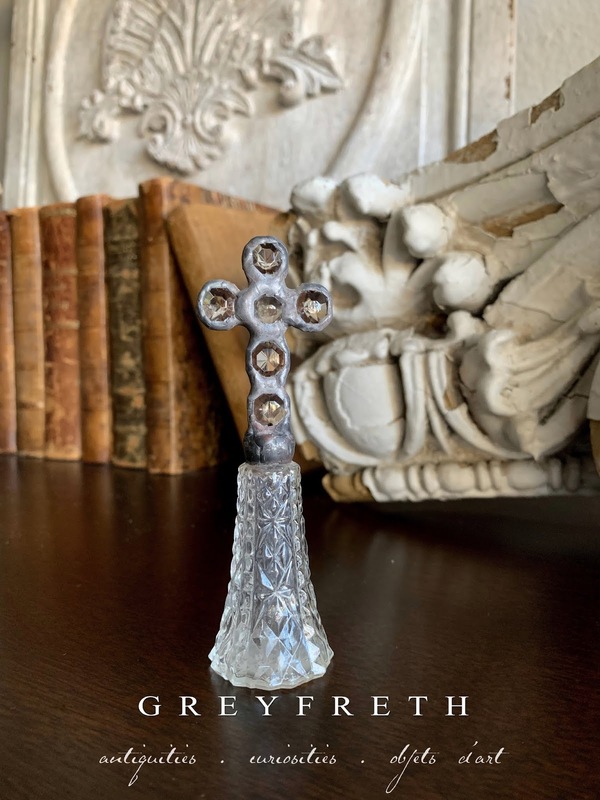 A beautiful mix of antique chandelier crystal remnants in various shapes and sizes radiate from a beautifully cut octagon center to form a simple yet elegant cross. The contrasting yet complementing elements are endless here -- The highly refractive crystal twinkles from within the frame of rough, rusted iron-hued solder that forever binds each to the other and to the bottle serving as a pedestal. An embossed shield-style logo adorns the front face of the vintage glass while an ethereal patina of soft white veils the interior. 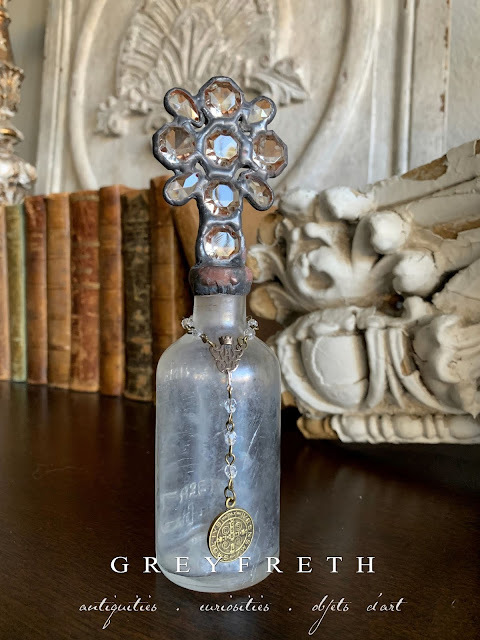 Bejeweling the bottle's neck is an antique rosary of olive wood, worn smooth from decades of prayer from which suspend antique religious medals of hallmarked sterling silver that adds a beautiful element of Grace. 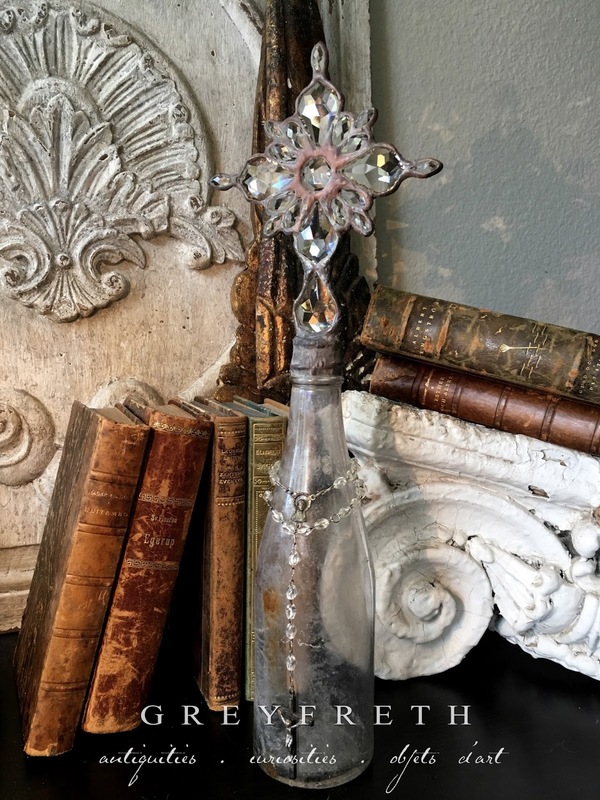 Austere beauty -- An ornate cross of meticulously cut Austrian chandelier crystals crowns an unearthed bottle of beautifully patinated, antique glass. Forever held within the confines of heavy solder, imbued in the weathered hues of rusted and salt eaten iron, the refined crystals throw light in all directions with their meticulously cut surfaces. A halo of crystal rings the solder studded rosette center. The petite octagons are remnants of a glorious chandelier from an Alabama plantation - they are weighty and vary slightly in size and shape as they were hand-cut. A band of weathered solder rings the base of the antique glass while, like a little surprise package, a riot of color flashes out of nowhere within the subtle patina when the light happens open it. Perfection. This entire pieces is a beautiful study in contradiction: old and new, rough and luxe, rustic and refined. Gorgeous alone and stunning mixed into any of our collections. An ornate cross of meticulously cut Austrian chandelier crystals crowns an unearthed bottle of beautifully patinated, antique glass. Forever held within the confines of heavy solder, imbued in the weathered hues of rusted and salt eaten iron, the refined crystals throw light in all directions with their meticulously cut surfaces. The crystals are faceted on both sides, allowing you to determine which side to face forward. Draped around the neck of the bottle is a hand wired rosary style lariat created with antique wooden rosary beads, well worn from prayer, strung with solid brass wire imbued in a gorgeous warm gold hue. Suspended from the lariat is an antique silver religious medal featuring Our Lady of Grace adding an element of sacred beauty. Forever held within the bounds of rough hewn solder and haloed by harlequin cut teardrops, a fiery Austrian crystal cross brings a contrasting elegance to the simple beauty of the antique, unearthed bottle which it crowns. Draped from the neck and adding an element of grace is a rosary remnant of cut glass worn smooth in places from countless prayers. 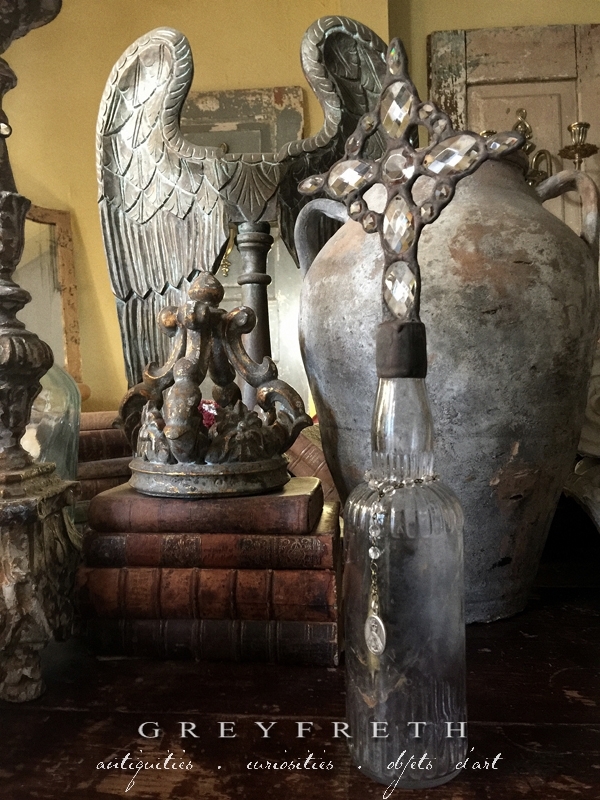 An ornate cross of meticulously cut Austrian chandelier crystals crowns an unearthed bottle of beautifully patinated, antique glass. Forever held within the confines of heavy solder, imbued in the weathered hues of rusted and salt eaten iron, the refined crystals throw light in all directions with their meticulously cut surfaces. A halo of crystal runs a ring around the center. The petite octagons are remnants of a glorious chandelier from an Alabama plantation - they are weighty and vary slightly in size and shape as they were hand-cut. A band of weathered solder rings the base of the antique glass while, like a little surprise package, the bottom of the bottle is the palest of sun purple and fades into an earthy rust, while a riot of color flashes out of nowhere within the subtle patina when the light happens open it. Perfection. A study in contrasting yet complementing beauty. An ornate starburst of refined, meticulously cut and highly refractive Austrian crystal are framed out in a contrasting organically sculpted, rough solder that has been washed in hues reminiscent of weathered, rusted iron. Serving as the perfect pedestal is an unearthed antique bottle of weighty glass. Donning the interior is a veil of subtle patina -- a visual memory of its century spent buried, hidden away underground. Bejeweling the neck is a stunning rosary of tarnished silver filligree bringing an element of grace and also dds another layer to the lovely contrast of rough and refined. A beautiful display of chandelier crystals in varying ages, shapes and sizes form an ornate and impressive cross. The contrasting yet complementing elements are endless here -- The profusion of crystal twinkles from within the frame of rough, dark solder that forever binds each to the other and to the bottle serving as a pedestal. A band of aged metalwork rings the bottle while a beautiful antique Italian rosary featuring a sterling cross which is embossed to read, "Terra Catacumba" is suspended from antique rosary beads, worn smooth from decades of prayer. 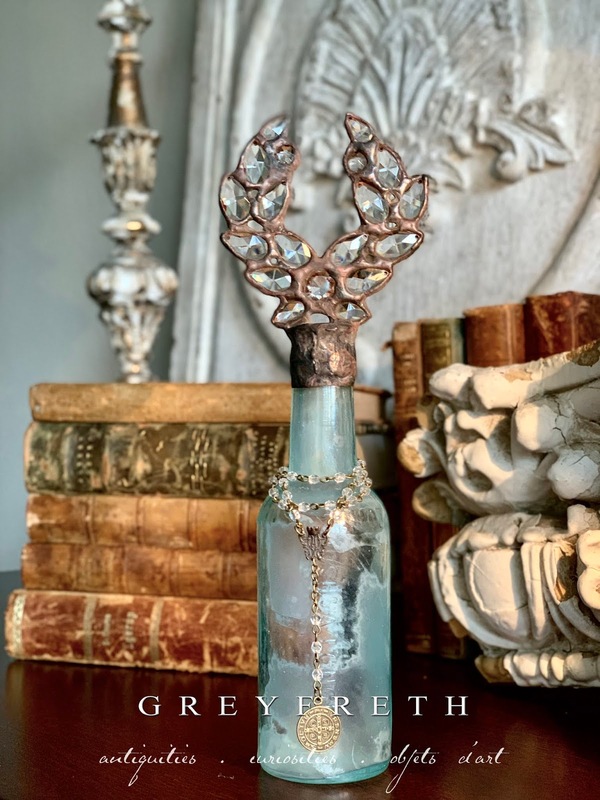 Elegant in its simplicity and framed within heavy solder of rusted iron hues, a cross of double-sided crystal chandelier rosettes crowns a patinaed bottle of antique glass. What is so special about the rosettes is the size— they are almost twice the size of ones we use when we can get them. The the pattern in the veil of patina and the rosettes together add texture and interest. 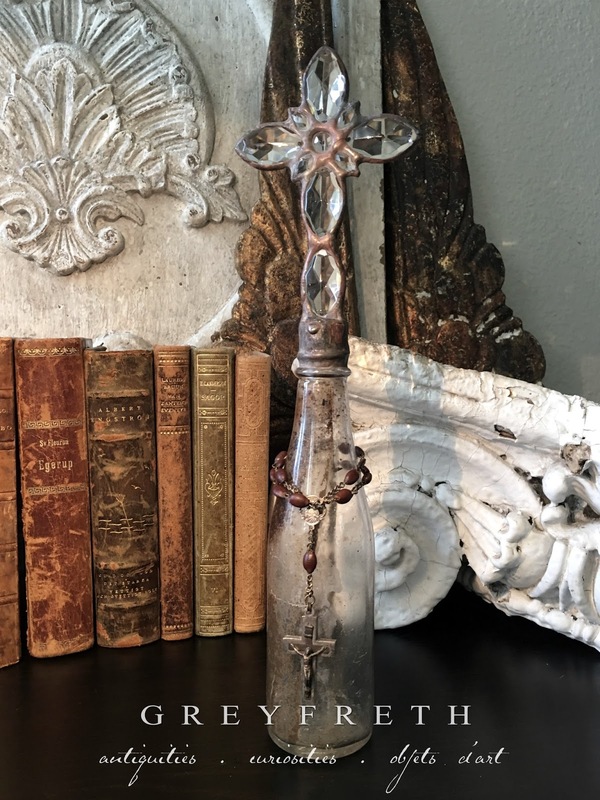 Adjusted to a smaller size, an antique rosary adds a lovely element of grace to this interesting piece. Weathered, heavy solder sits beautifully at the heart of each rosette of the cross - creating contrast in feel and tone to the delicate nature of the crystal and glass - a beautiful juxtaposition of rough and luxe. A symphony of both contrasting and complementing beauty - Framed out in heavy, organically sculpted solder, reminiscent of weathered and rusty iron, French Pendalogue crystals form a cross of grace and beauty. Serving as the perfect pedestal is an unearthed antique bottle with an ethereal patina. Imbued with remnants of its earthly hiding place of over 100 years, the patina boasts variegated hues of pale whites which veil the surface of the paneled glass. Draped from the neck and adding an element of grace is a lariat of antique seed pearl rosary beads and a beautiful antique religious medal featuring the sacred heart. Framed out in organically sculpted, weathered solder, faceted crystal chandelier remnants form a simple, yet elegant cross. A beautiful example of the juxtaposition of rough and refined. The harlequin pattern of the crystal teardrops adds just the right amount of ornate detail while a simple sacred heart rosary adds a beautiful element of sacred beauty. Serving as the pedestal for the cross is an unearthed paneled bottle donned in a heavily calcified patina imbued with a stunning natural iridescence. Beautifully cut to refract the most light possible, lovely teardrops of Austrian chandelier crystal form a simple yet elegant cross. The contrasting yet complementing elements are endless here -- The refined leaded crystal twinkles from within the frame of rough, heavy solder that forever binds each to the other and to the bottle serving as a pedestal. 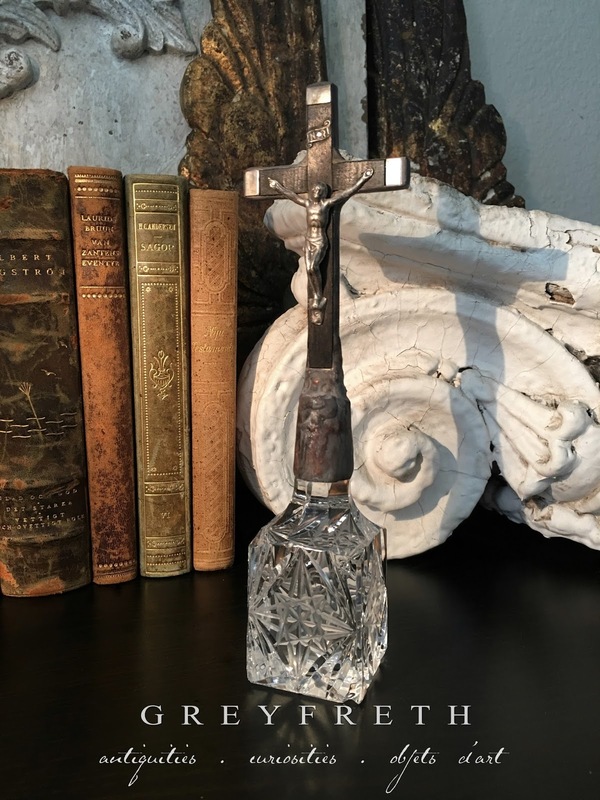 Strong and linear icicles of leaded crystal radiate from the center of the cross like sun rays while a soft veil of ethereal patina enshrouds the antique glass. Elegant in its simplicity, this cross bottle is truly a little powerhouse of beauty. Marquis shaped crystal and diminutive teardrops, both meticulously cut,twinkle from within a frame of heavy, organically sculpted solder. A perfect dance of opposite yet complementing loveliness. 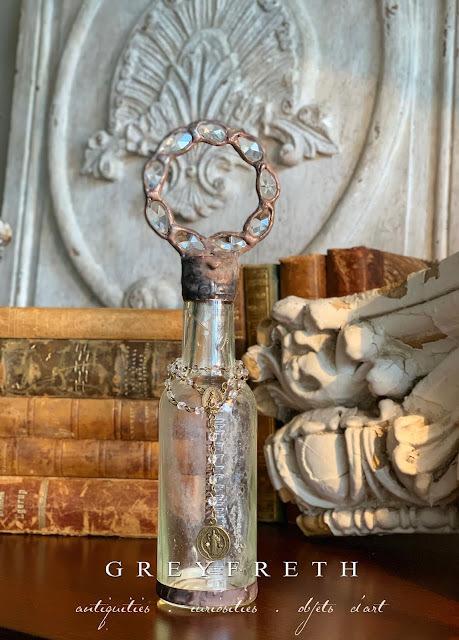 The refinement of the crystal also both contrasts and complements the bottle's soft, ethereal patina of pale whites which enshrouds the century old glass. 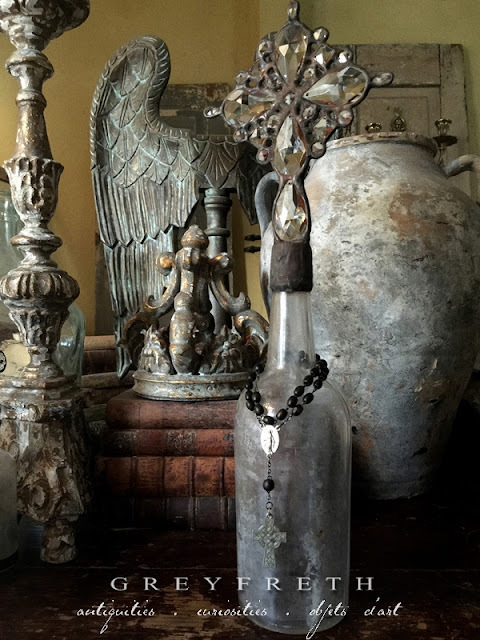 An antique Italian rosary bejewels the neck of the bottle with its hand carved wooden beads that blend nicely with the patina of the bottle. suspended from the beads is a ebony and sterling cross that opens and is embossed "Roma". 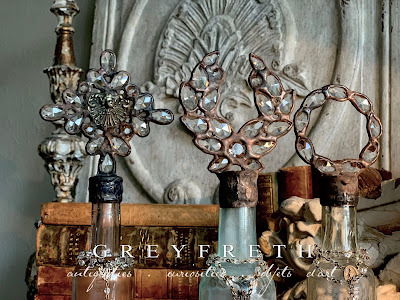 Held fast by organically sculpted, rustic solder in weathered and timeworn hues, a plethora of fiery multi-faceted, both weighty and diminutive crystal chandelier remnants form this ornate cross. The crystals are faceted on both sides, allowing you to determine which side to face forward. The crystal cross offers an element of refinement which beautifully complements and contrasts with the rustic nature of the metalwork and the ethereal patina of the unearthed antique bottle. 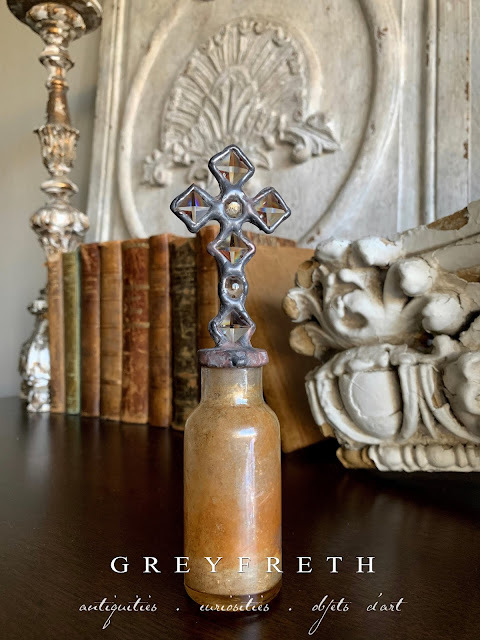 Draped around the neck of the bottle are century old, raw tiger’s eye rosary beads that have been worn smooth over decades of being used in prayer. 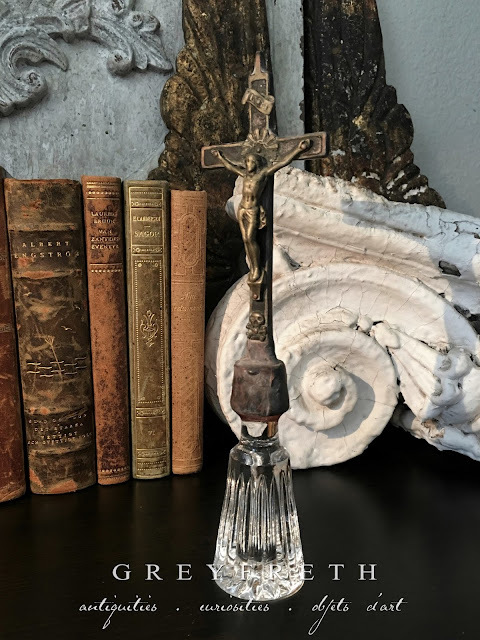 A beautifully detailed connector of antique sterling suspends a doubled sided reliquary with a painting of Our Savior under glass which adds a lovely element of grace. A rhapsody of gorgeous texture and tones - Framed out in heavy, organically sculpted, crusty solder, a fiery cross of faceted antique chandelier crystal in two different lengths and style catch and refracts an amazing amount of light - throwing a confetti of color in all directions. A small round of Brazilian Agate serves as the heart of the cross, bringing in an earthy beauty. Suspended from an antique rosary chain of bronze and timeworn wooden beads is a 2-sided religious medal which brings in a beautiful element of grace. Heavy, hand-sculpted metalwork, washed in the timeworn and rusted hues of old weathered iron, frame the plethora of ornate antique crystal chandelier remnants to form a small, elegant mix of our Starburst crosses and our French Alisee cross. With subtle differentiation in size and shape, it is beautifully apparent that each crystal has been hand cut with the purpose to catch and refract as much light possible as witnessed by the confetti of color which is thrown when light washes across the faceted crystal surfaces. 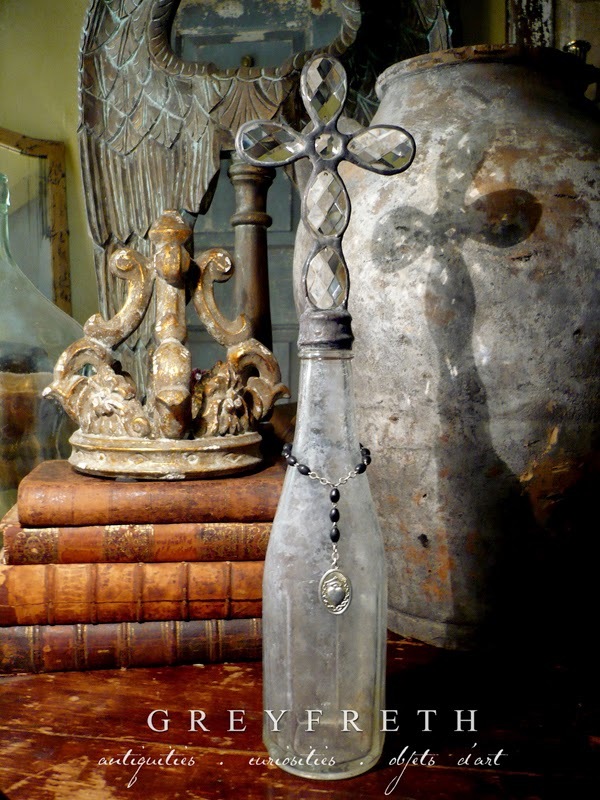 Diminutive sisters of our larger icicle crystals embellish the rustic cross and brings an element of elegance to the usually rustic version.The rough yet refined cross crowns an unearthed bottle donning an ethereal veil of pale patina created naturally over the many decades spent buried and hidden away within the earth. 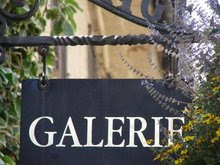 A beautiful piece from our French Alisee Collection and a perfect gift, start or addition to any discerning collector's anthology. Beautifully cut to refract the most light possible, lovely Marquis cut Austrian chandelier crystal have a watery element and form a simple yet elegant cross. Small yet weighty of geometrically cut crystal spray out from between the chandelier crystals like sun rays. The contrasting yet complementing elements are endless here -- The refined leaded crystal twinkles from within the frame of rough, heavy solder that forever binds each to the other and to the bottle serving as a pedestal. The antique glass is veiled in a alabaster like patina and looks metallic in certain light. A perfect addition or start to your collection. Framed out in heavy, organically sculpted, weathered solder, a fiery cross of leaded crystal catches and refracts an amazing amount of light - throwing a confetti of color in all directions. The rusty solder picks up the tones in the earthy, yet ethereal patina within the paneled bottle. Subtle flashes of iridescence within the patina complement the refracted light of the crystals. 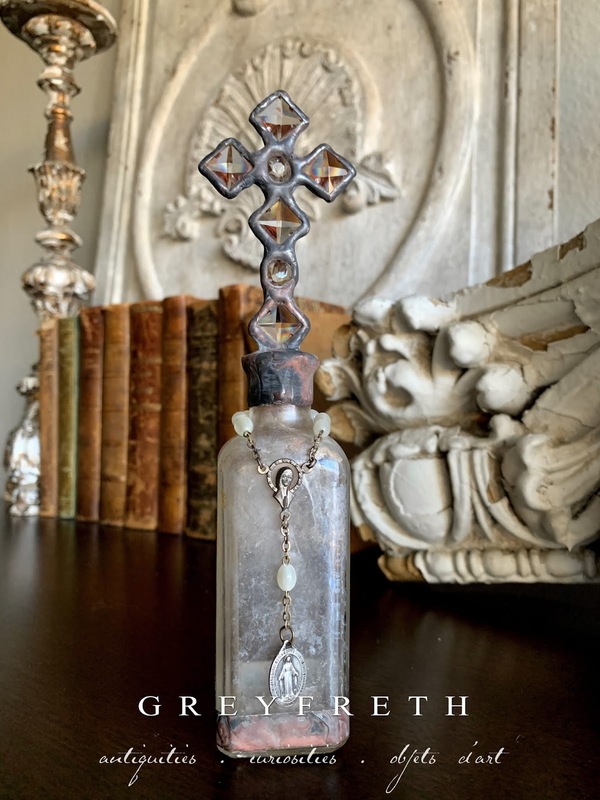 Antique rosary beads, worn from decades of prayer adorn the neck of the unearthed bottle and feature a century old French religious medal of sterling silver which adds an additional element of grace to this one of a kind piece of art. A rhapsody of gorgeous texture and tones - Framed out in heavy, organically sculpted, crusty solder, a fiery cross of faceted antique octagon chandelier crystal catches and refracts an amazing amount of light - throwing a confetti of color in all directions. Small teardrops of Czechoslovakian crystal bejewel the cross, giving it an ornate presence. Suspended from a bronze and opalescent gems antique is a simple yet elegant cross of oiled bronze and a 2-sided St. Benedict medal, bringing in an beautiful element of grace. Framed out in heavy, organically sculpted, weathered solder, a fiery cross of Austrian crystal chandelier remnants catches and refracts a confetti of color in all directions when the light dances across its faceted surface. The weathered, crusty solder is a beautiful contradiction in texture and presence to the refinement of the star-cut crystal. 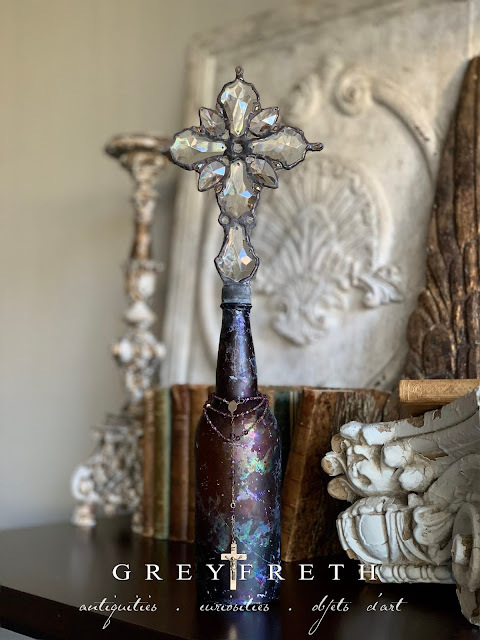 Veiled in a slightly iridescent, ethereal patina, the antique glass of the bottle flashes with the same confetti of color as the cross of crystal. Within the unearthed bottle, a minute spray of earth still clings to the inner walls - memories of its century spent hidden away within the underground. Complementing the slight iridescence within the patina are the small, opalescent beads of the rosary that is draped around the neck. Hand strung with oiled bronze wire, the rosary features an antique sterling silver medal depicting Our Lady of Grace, adding another sacred element. Framed out in heavy, organically sculpted, weathered solder, a fiery cross of square Austrian crystal chandelier remnants have been turned on edge to catch and refract a confetti of color in all directions when the light dances across its faceted surface. The weathered, crusty solder is a beautiful contradiction in texture and presence to the refinement of the star-cut crystal. Veiled in a slightly iridescent, ethereal patina, a fine mist of earth dons the inner walls of the bottle - memories of its century spent hidden away within the ground. Meticulously cut antique chandelier crystals of this simple yet elegant cross twinkle in stark and beautiful contrast to the rough solder that binds them. The clear glass possesses the faintest trace of pale sea foam blue. A subtle iridescent patina dons the antique bottle while traces of earthly remnants veil the inside of the glass, bearing witness of decades hidden within the sea. Draped from the long, slender neck is a piece created from antique rosary remnants. Hand strung with beautiful crystal beads and warm brass wire and chain. A Well worn antique religious medal of sterling silver offers a lovely, sacred presence. Framed out in heavy, organically sculpted, weathered solder, a fiery cross of square Austrian crystal chandelier remnants have been turned on edge to catch and refract a confetti of color in all directions when the light dances across its faceted surface. The weathered, crusty solder is a beautiful contradiction in texture and presence to the refinement of the star-cut crystal. Veiled in a slightly iridescent, ethereal patina, patterns and sprays of dark earth don the inner walls of the bottle - memories of its century spent hidden away within the ground. The meticulously cut antique chandelier crystals of this simple yet elegant cross twinkle in stark and beautiful contrast to the rough frame of aged solder that binds them. The square crystal has been turned on its axis to provide more refraction and interest. An unearthed vessel of antique glass bearing a beautiful, ethereal patina serves as a perfect pedestal in this lovely juxtaposition of rough and elegant. The bottle is embossed and reads, "Lambert Pharmacal Company - Listerine"
Framed out in heavy, organically sculpted, weathered solder, a fiery cross of square Austrian crystal chandelier remnants have been turned on edge to catch and refract a confetti of color in all directions when the light dances across its faceted surface. The weathered, crusty solder is a beautiful contradiction in texture and presence to the refinement of the star-cut crystal. Veiled in a slightly iridescent, ethereal patina, patterns and sprays of rust hued earth don the inner walls of the bottle - memories of its century spent hidden away within the ground. Held fast by organically sculpted, rustic solder in weathered and timeworn hues, a floral-like array of fiery multi-faceted, weighty crystal chandelier remnants form this lovely cross. The crystals are faceted on both sides, allowing you to determine which side to face forward. The refraction is amazing and sends a confetti of color when the light happens upon the surfaces. 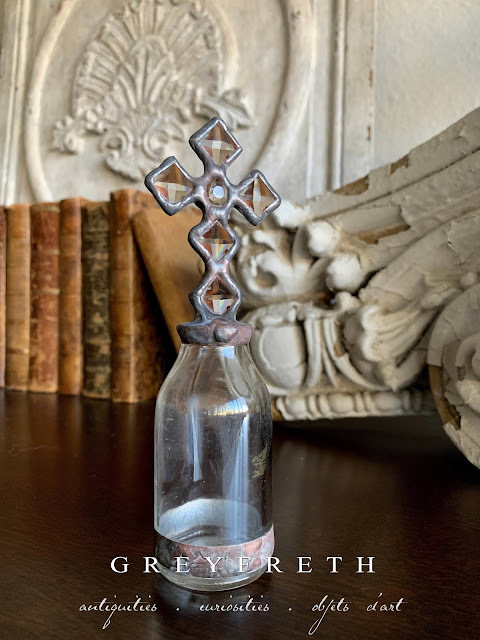 The crystal cross offers an element of refinement which beautifully complements and contrasts with the rustic nature of the metalwork, the slight, ethereal patina of the tincture bottle. A perfect study in contrasting beauty. Beautifully faceted chandelier remnants of antique crystal are designed in a simple, yet striking cross. Rustic solder frames and binds the delicate crystals together and to their slender pedestal of Antique glass. Weathered and worn swathes of rust and earth have been perfected by nature and turned into a patina that resembles alabaster across the front of the antique glass. 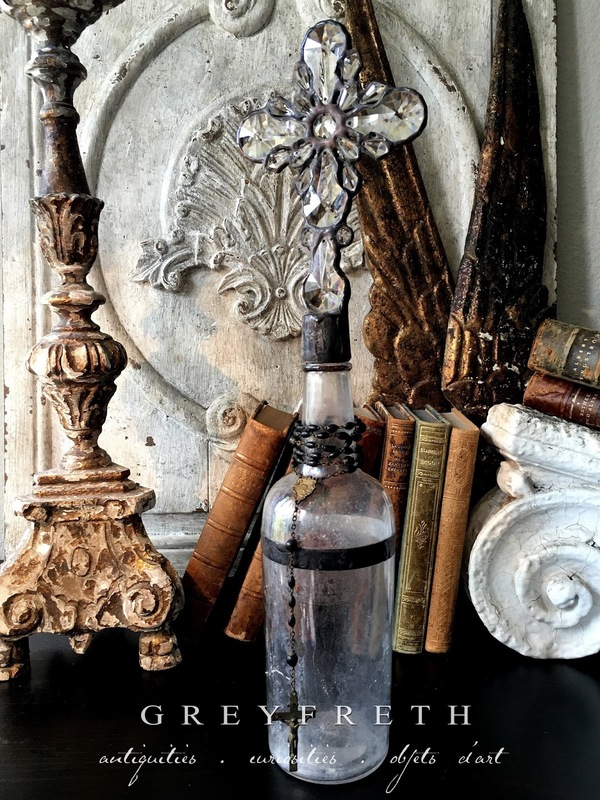 We especially love this really rustic bottle paired up with our leaded crystal decanter cross bottles - the mix of rough and refined is our signature and a beauty beyond words. Meticulously cut diminutive chandelier crystals of this simple yet elegant cross twinkle in stark and beautiful contrast to the rough frame of aged solder that binds them. A petite vintage vessel of beautifully cut crystal serves as a perfect pedestal in this lovely juxtaposition of rustic elegance. Little Powerhouse of Beauty -- Meticulously cut diminutive chandelier crystals of this simple yet elegant cross twinkle in stark and beautiful contrast to the rough frame of aged solder that binds them. 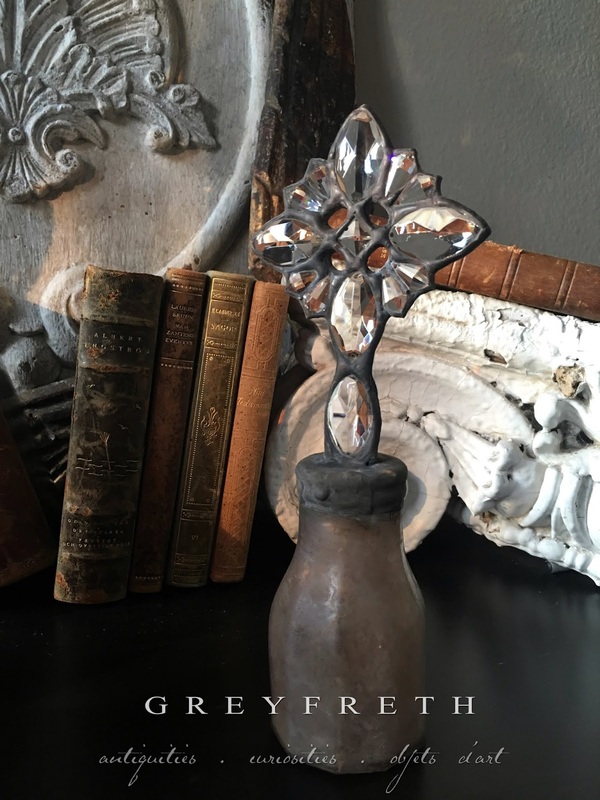 A petite vintage vessel of beautifully cut crystal serves as a perfect pedestal in this lovely juxtaposition of rustic elegance. 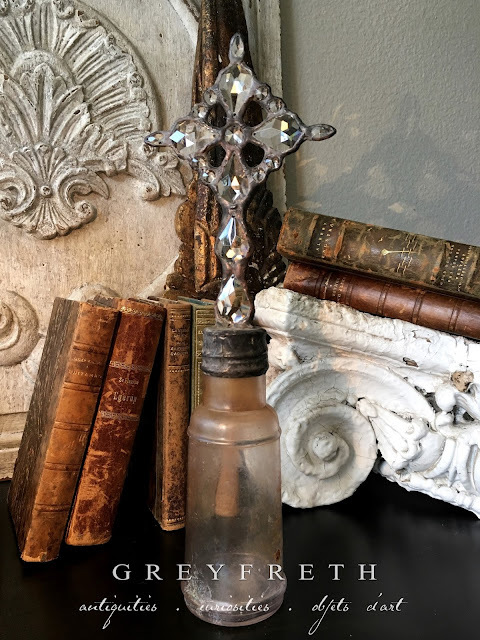 Faded and worn smooth in places from decades of prayer, an antique rosary crucifix of silver and brass is even more lovely in its patina and tarnished beauty. Once suspended from an ornate, antique rosary, the sacred piece now crowns an antique unearthed bottle with its own interesting patina. Trapped within the walls are remnants of the earth which hid it for decades and an ethereal veil of soft white and a faint iridescence visible when the light washes over the glass. A study in perfection within imperfection, this lovely piece is beautiful alone or adds grace to any of our collections. A petite cross of diminutive crystal chandelier remnants is held fast with weathered solder, tinted the hues of rusted iron, to a small medicinal bottle of antique glass. The crystals are cut to catch and refract an incredible amount of light. The bottle serving as the pedestal boasts glass over a century old and two bands of metalwork ringing the base. A perfect addition to your collection or gift for someone special. Beautifully faceted diminutive chandelier remnants of leaded crystal are designed in a simple, yet beautiful cross. Rough, organically sculpted solder frames and binds the delicate crystals together and to their pedestal of Antique glass. Weathered and worn, bits of rust and earth don the glass, a testament to its decades hidden within the earth. Weathered and worn smooth in places from decades of prayer, an antique crucifix of silver is lovely in its patina and tarnished beauty. Once suspended from an antique, ornate rosary, this lovely aged beauty now crowns a slender paneled bottle of unearthed, century old glass. Soft waves of creams, greys and rust don the surface of the bottle giving it an opaque beauty much like alabaster. A study in perfection within imperfection, this lovely piece is beautiful alone or adds grace to any of our collections. Meticulously cut antique chandelier crystals of this simple yet elegant cross twinkle in stark and beautiful contrast to the rough frame of aged solder that binds them. 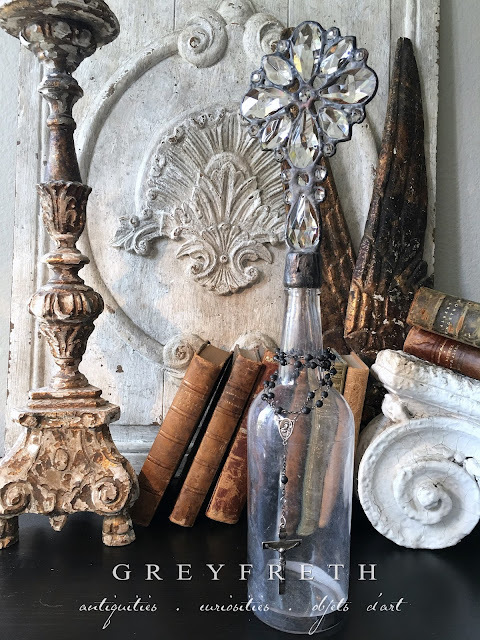 An unearthed petite perfume bottle bearing remnants of the ground which kept it hidden for decades has been ringed in a band of metalwork and serves as a perfect pedestal in this lovely juxtaposition of rustic elegance. The meticulously cut antique chandelier crystals of this simple yet elegant cross twinkle in stark and beautiful contrast to the rough frame of aged solder that binds them. An unearthed vessel of antique glass bears a patina consisting of remnants of the earth – a testament to its decades hidden away buried underground. Small in stature, yet powerful in beauty. Pieces from our Diminutive Collection are beautiful alone, grouped or peppered into any of our collections. 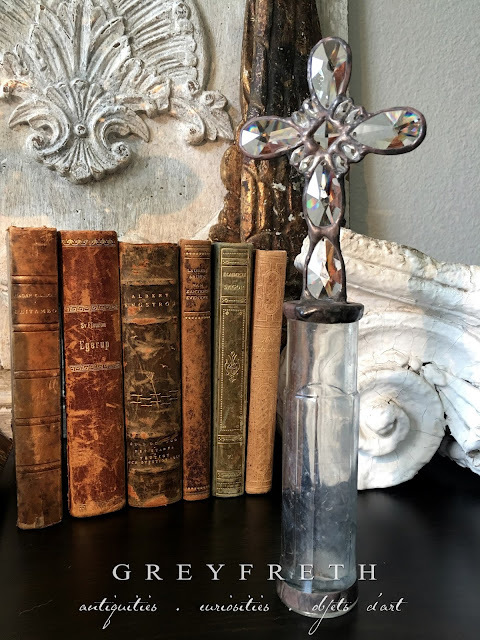 We love a cluster of these little powerhouses of beauty on a coffee table, in a mantle vignette, as part of a bookshelf display, on a bedside table - the possibilities are endless. Dark, rustic and weathered metalwork forever bind an intricately carved Medieval style cross of aged pewter to an embossed Lamberts antique bottle veiled in a beautiful ethereal patina. A ring of textured solder, reminiscent of worn, rusting iron bands the base of the bottle which adds another layer of beauty. 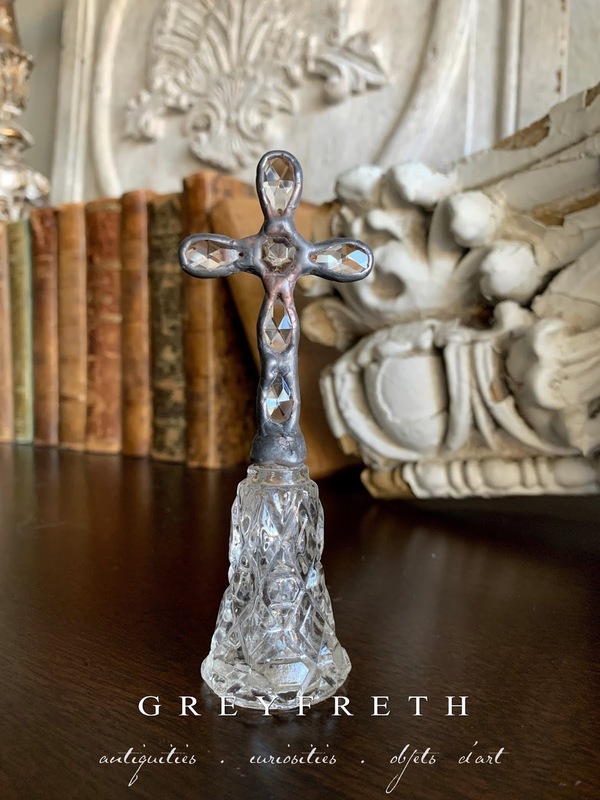 A lovely piece of our original Cross Bottle Collection that would be a perfect addition to any discerning collector's anthology. 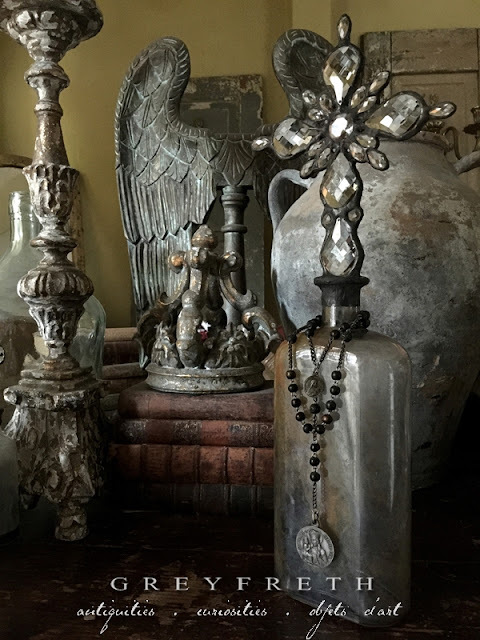 Forever joined by organically sculpted solder, a small aged and riveted pewter cross crowns a petite, unearthed tincture bottle of antique glass. Time and the elements have created ethereal patterns of soft whites, greys and rust on the glass while remnants of the earth that hid the little bottle away for decades don the interior, creating additional depth and character. In the light, the glass has a subtle iridescence and an opaqueness mirroring the qualities and color of alabaster. An embossed cartouche of sorts adds an elegance to the piece while trios of aged rivets gracing the cross have been sanded back, adding a silver contrast to the dark, rustic patina. A lovely member of our original Cross Bottle Collection, this would be a great start or addition to any of our pieces. 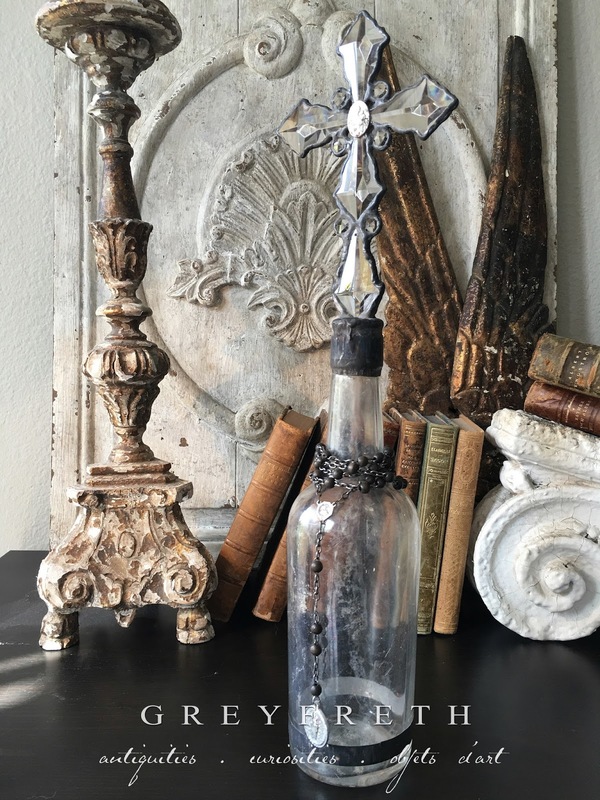 Heavy solder, imbued in the variegated hues of weathered iron, forever bind an intricately carved Celtic style cross of crusty, weathered and aged pewter to a small but weighty unearthed bottle of wavy glass. 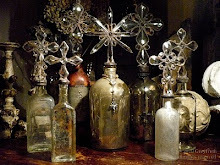 Hand-blown and wonderfully irregular, a plethora of tiny seed bubbles reside within the walls of antique glass. There is a very, very faint sun purple tint to the glass from a reaction between the Manganese in pre-1915 glass and years exposed to UV light. A beautiful addition to any of our collections yet lovely enough to stand on its own. 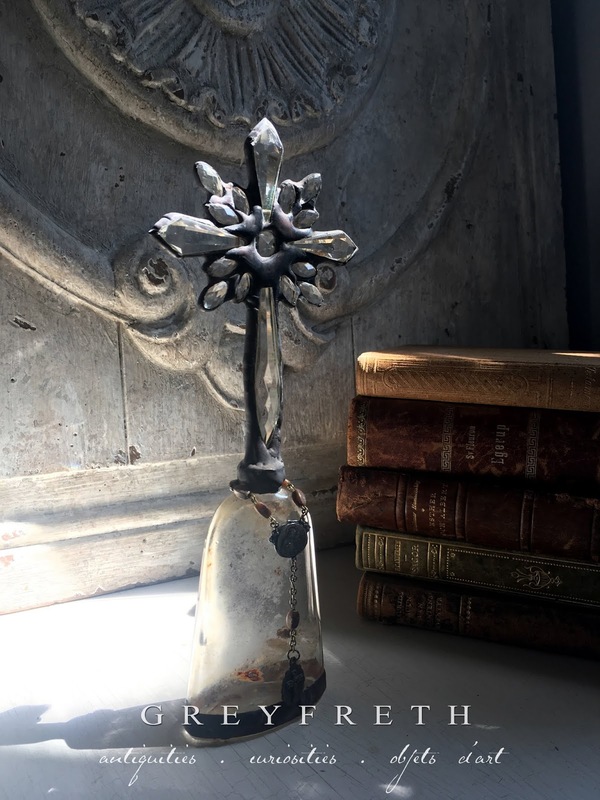 Forever bound by organically sculpted solder, the aged and riveted small pewter cross crowns a petite, unearthed bottle of antique glass donned in a subtle veil of pale whites. Worn embossing, adds interest while a watery feel to the folded glass brings depth and character. Trios of aged rivets gracing the cross have been sanded back, adding a wonderful shiny silver contrast to the dark, rustic patina. A lovely piece of our original Cross Bottle Collection that makes a thoughtful gift or an addition to your own collection of our artwork. 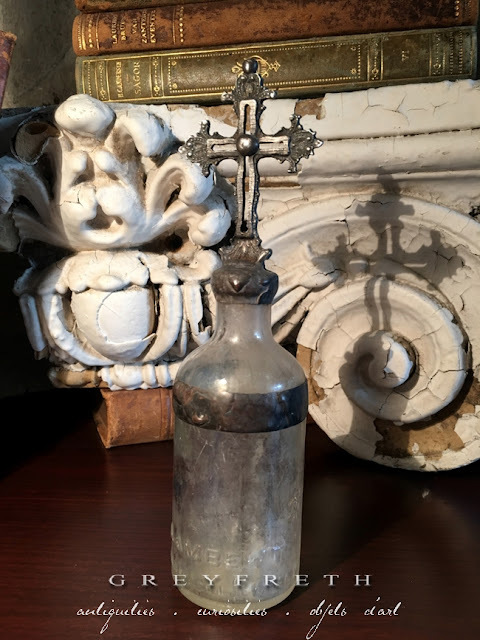 Held fast within heavy solder, reminiscent of weathered and rusted iron, a diminutive crucifix of aged pewter crowns a small unearthed tincture bottle of antique glass. Faint swathes of rust dot the bottle walls while the weighty glass holds faint remnants of the original amber content and of the earth - memories of the decades spent hidden away below ground. Petite and sweet, this tiny piece is a great addition to your collection or a small but mighty presence on its own. The clear (or as we call them, white) antique cross bottles of Isabeau Grey® range in size, patina and shape - graceful and perfect within their imperfections brought on by time and the elements. Beautiful alone -- stunning en masse. For access, please Email us. © Copyright 1998 - 2019 Isabeau Grey, Inc. —All rights reserved. Reproduction or use, in whole or in part, in any manner, without the prior written consent of the copyright holder, is a violation and actionable offense of copyright law. All written text, design, graphics and photos on this site (unless otherwise credited or stated) are the sole property of Isabeau Grey, Inc. --they may not be copied, reproduced, altered, manipulated or used in any way without prior written consent.